We've got homes for sale in Huntersville, NC! Huntersville is one of the hottest and most sought-after towns in Mecklenburg County. It is the first of three suburban towns that enjoy the amenities of Lake Norman when traveling north outside of Charlotte metro area, making its proximity to the Queen City a prime place to live. "Work in the city, play on the lake." 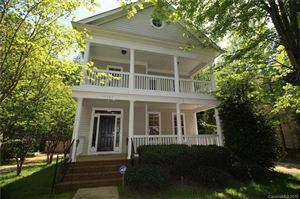 Search Huntersville homes for sale below the map. Realtor® Rachel Lewis of our Lewis & Kirk real estate firm, calls Huntersville her home. She will assist you in your next real estate adventure whether you're buying or selling your home in Huntersville. Huntersville is one of three towns (the others are Cornelius and Davidson) located north of Charlotte, North Carolina, but still within Mecklenburg County. These three towns make up the area known as "North Meck." Express bus transportation and an interstate with HOV lanes that ends five miles south of Huntersville provide access to the downtown business areas of Charlotte, making Huntersville primarily a town of commuters. Convenient to I-77, this community offers all the conveniences of a big city with tree-lined streets, amenity-filled neighborhoods and A+ rated schools! The population was 46,773 at the 2010 census and had increased to 52,704 according to the 2015 census annual estimate, making Huntersville the 17th largest municipality in North Carolina. Two exits from Interstate 77 serve Huntersville. Exit 23 (Gilead Road) connects the expressway to the original town. Exit 25 (North Carolina Highway 73, but most often referred to as Sam Furr Road) provides access to the Birkdale Village area and shopping, medical, and office complexes that have been built since the exit opened. Huntersville is headquarters to the NASCAR race shops of Joe Gibbs Racing, located in the Huntersville Business Park off I-77 exit 23. The shop currently operates four Monster Energy NASCAR Cup Series teams: the #11 FedEx Toyota Camry, the #18 M&M's Toyota Camry, the #19 Arris Toyota Camry and the #20 DeWalt/Tide Toyota Camry.